The river Danube has its source in the Black Forests, flowing into the Black Sea. Europe's second biggest river strongly influences both the surrounding landscape and its people. Since Linz was the official European Culture Capital in 2009, the lovely town on the river Danube has permanently improved its rich artistic and cultural heritage. The river itself stands for a source of life, a source of culture. The famous Linzer Torte cake ranks among the town's culinary highlights, filled with redcurrant jam and covered with powdered sugar this wonderful delight attracts visitors from around the world. Linz focuses on both culture and nature coupled with elements of modern architecture. The town boasts incredible 50 parks and public gardens, thus being one of Austria's greenest cities. Besides recreation and swimming fun at three lakes - Pichlinger See, Pleschinger See, Kleiner Weikerlsee – the recreational area of Ländn makes a real nature paradise for young and old. Additionally, the renowned Donaulände event area hosts varied international highlights and is home to the superb Lentos Art Museum, the Brucknerhaus Museum and a metal sculpture park displayed at the "forum metal". Lovers of contemporary art visit the Lentos Museum while future-oriented people get together at the Ars Electronica Center and cultured music fans meet at the Brucknerhaus. Anton Bruckner composed his very first symphony in Linz where the yearly held Bruckner Fest reminds of this fantastic musician. In cooperation with the concurrent Ars Electronica Festival music is transformed into images and breathtaking fireworks. Further world-famous events are "Klangwolke" music installation, "Pflasterspektakel" street fest and "Crossing Europe" film festival. If you want to know more about the future you should discover the past. Many historical buildings embedded in top modern surroundings remind of the pre-industrial time in Linz. The town on the river Danube has one of Austria's oldest churches consecrated to St. Martin. Another must-see is the Castle of Linz and the Castle Museum towering high above the old town. First mentioned in historical documents already in 799, it also offers stunning views of the town and the surrounding Mühlviertel region. The Old Town Hall is situated right at the heart of Linz, featuring an octagonal tower with an astronomical clock. From the main square the unique "Pöstlingbergbahn" narrow-gauge nostalgia train takes visitors up to Pöstlingberg and its deeply rooted Pöstlingsberg pilgrimage basilica. Great view of Linz and the river Danube. The innovative art and culture made Linz the European Capital of Culture 2009. 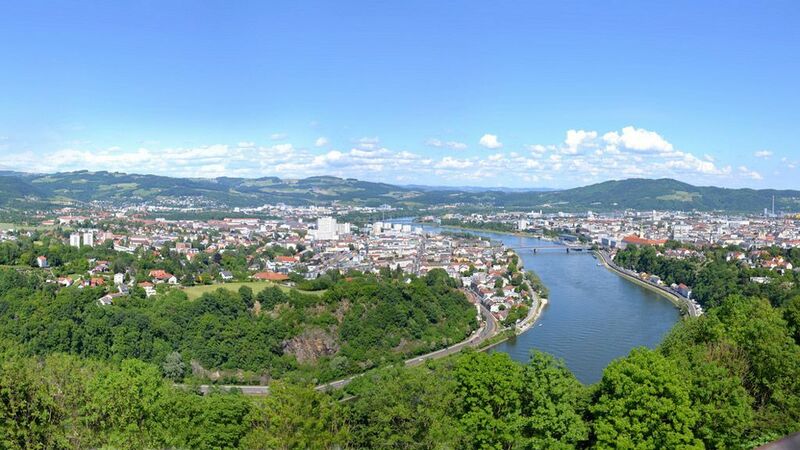 Upper Austria's capital Linz sprawls along the banks of the Danube and is situated on the ancient Salt Road, that used to link Salzkammergut to Bohemia. Thus Linz is an industrial and manufacturing center with a long history. Today, the thriving town has an international Airport and the biggest port on the Danube and is well known as a center for education as well. The innovative art and culture made Linz the European Capital of Culture 2009. Welcome to Linz by the Danube! Upper Austria's capital definitely should be on the itinerary of every visitor to Austria. Linz offers a perfect blend of cultural pursuits and fine sightseeing options. The cultural wealth and the many attractions of the picturesque town center bear witness to the past glory and present beauty of Linz. Visit the new Lentos Art Museum by the Danube and the unique Ars Electronica Center. A ride on Europe's steepest train up to Pöstlingberg Mountain creates memories that will stay with you forever. Stroll around the lovely old town quarter and soak up the enjoyable atmosphere of the Baroque downtown square. And don't miss out on tasting a delicious piece of the Original Linz Cake at a coffeehouse - and take one with you as a gift for your loved ones at home! "Blue Danube Airport" Airport of Linz is situated in the south-west of Linz (outside the city). Shuttle Service: Passengers arriving in Linz are invited to use the free shuttle service between Linz Airport and Hoersching station from 5.00 a.m. to 10 p.m., available on request. This transfer takes about three minutes. To order a shuttle service, please contact the information desk at the airport or the station manager at Hoersching station. The bus is a comfortable and quick way to get to the airport.